During the evening of February 7th, 2008, a series of explosions at the Imperial Sugar manufacturing facility in Port Wentworth, Georgia, just outside of Savannah, resulted in the deaths of fourteen workers and numerous injuries. According to Georgia Fire Commissioner John Oxendine, "It was a very large explosion that totally destroyed the three-story building where it took place. "1 The explosion is believed to have been fueled by the ever-present sugar dust, an inherent aspect of the sugar refining process, which would coat surfaces and equipment in the facility. A resulting investigation performed by the U.S. Chemical Safety Board looking into the explosion concluded that the incident was "entirely preventable" and was the result of "inadequate equipment design, poor maintenance and ineffective housekeeping. "2 The sugar conveyor located between two of the sugar silos on which the explosion most likely occurred was "found [to have] sugar dust four feet thick in some areas. "3 In industrial settings such as this, utilizing equipment that is designed specifically for explosion prone areas can substantially reduce the risk of combustion. 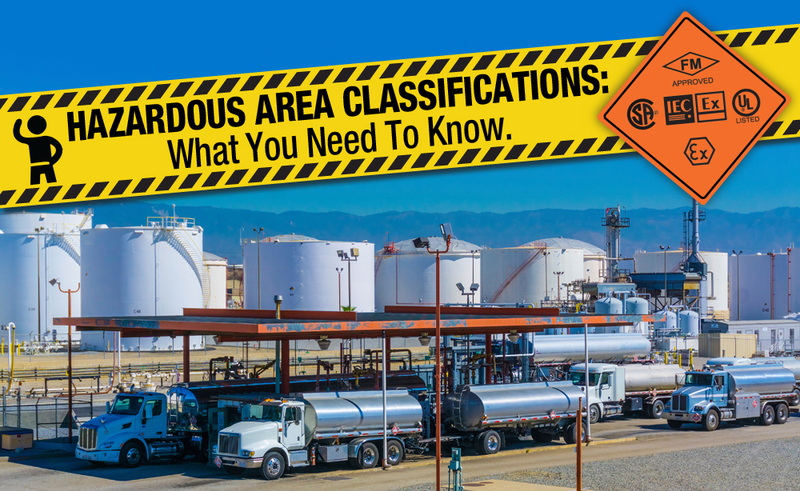 An industrial area is considered a hazardous area when it contains three fundamental components: A flammable substance (which can be a gas, liquid, or solid), an oxidizer, and a source of ignition. The flammable substance can be anything from gasses and liquids such as hydrogen, gasoline and kerosene, to solid particulate such as dust or small fibers. The oxidizer is usually just the oxygen present in the open air. The source of ignition can be something obvious like a spark or open flame, or something seemingly more innocuous like excessive heat which can cause spontaneous combustion of certain materials. Hazardous area standards require the use of equipment specifically certified for use in areas that have all three of the above ingredients for an explosion. Though the goal of all hazardous area equipment is to prevent an explosion, the methods that they use vary depending on their manufacture and intended application. There are three primary ways to prevent an electronic device from causing an explosion. The first is to contain the explosion with an explosion proof device or enclosure. This approach is for equipment which, by its very nature, is going to generate enough electrical current and/or heat to cause an explosion if in contact with an explosive substance. In the case of an explosion, however, the device itself or the enclosure that encapsulates the device will contain the explosion and prevent it from spreading. The second approach to simply remove the possibility of a spark or other source of ignition. This can be accomplished by keeping the temperature low, keeping all electronics secure or using a device that does not generate enough heat or electrical current to create combustion when in the presence of a flammable substance. The third approach is to simply isolate the explosive substance from anything that could possibly ignite that material. This, however, is not always possible. As may already be apparent, ensuring safety in a hazardous area is not a very straight forward matter. There are many different industries in which certain areas of their operations may be considered hazardous and several different means by which to prevent an explosion from occurring. It may not even be apparent to those in these industries that the potential for an explosion even exists. This is why there are many regulations, guidelines and laws guiding these industries toward implementing the best practices available. The agencies maintaining and enforcing these are the country's National Electrical Code (or equivalent organization), National Fire Protection Association, OSHA (in the United States), and the requirements of the facilities' specific insurance company. These organizations will require, among other things, the use of hazardous area equipment in areas which possess the three components necessary for an explosion. What equipment is qualified for use in a hazardous area is regulated by many certifying agencies. In North America, traditionally, FM (Factory Mutual) and UL (Underwriters Laboratories) provide standards, testing and certification in the United States while CSA (the Canadian Standard Association) does the same for Canada. More recently, UL, FM, and CSA have all implemented programs allowing certifications to be valid in both countries. Outside of North America, ATEX (Appareils destinés à être utilisés en ATmosphères EXplosives) and IEC (International Electrotechnical Commission) provide standards that are recognized internationally. These organizations, unlike FM, UL and CSA, do not perform their own testing but rather have notified bodies perform the testing to meet the standards they set. Many North American companies will certify their products to ATEX and/or IEC standards in order to make them applicable to international businesses. Though there are differences between the certifications that these organizations offer, the major reasons for choosing a product certified through one organization over another are the location of the facility and the requirements of the local regulations. FM (Factory Mutual) and UL (Underwriters Laboratories)provide standards, testing and certification in the United States. CSA (Canadian Standard Association) does the same for Canada. UL, FM, and CSA all have implemented programs allowing certifications to be valid in both countries. ATEX (Appareils destinés à être utilisés en ATmosphères EXplosives) and IEC (International Electrotechnical Commission) provide standards that are recognized on a more international level. Unlike FM, UL and CSA, they do not perform their own testing but rather have notified bodies perform the testing to meet the standards they set. These organizations have a (relatively) uniform approach when it comes to actually classifying equipment for use in hazardous areas. Through rigorous testing, a piece of equipment is assigned an area classification, division or zone, equipment group, and temperature class. An example of a Class I area would be an oil refinery, paint shop, or offshore oil rig. A Class II might be a coal mine, grain silo or hay storage facility. Class III would be something like a paper mill, textile mill, or woodworking facility. Furthermore, a division or zone is assigned to the product. This is a description of the frequency with which the combustible gas and/or dust is present within the hazardous area. Divisions were used in older North American hazardous area standards, while zones are used in European/International standards as well as newer North American Standards. The newer standards have switched to the use of zones, in part because they break down areas that previously were only described by two divisions into three more precise zones. Zones also have the added benefit of including the area classification with the zone description. Zone 0 describes an area in which a combustible gas will be present continuously while zone 20 describes an area in which combustible dust will be present continuously (the '2' in 'zone 20' indicates dust as opposed to gas). The equipment group describes the type of hazardous material that is or could be present in the hazardous area. North American and international organizations use different standards to represent the equipment group, but they all describe the same thing: the type of combustible material in the presence of which the equipment can be operated. Lastly, a device meant for use in a hazardous area is assigned a temperature class. The temperature class is the maximum ambient surface temperature the device can reach (under maximum dust layers where applicable). This rating is given to help prevent combustion based on the combustion point of the material present in the area. This is used to determine the ambient operating temperature of the device. The approved product will also have a maximum ambient operating temperature. Most facilities will want to operate at a maximum of 80% or below of the maximum ambient operating temperature. Some examples of temperature ratings commonly seen on devices are T1 (450°C), T3 (200°C), T4 (135°C), and T6 (85°C). Traditional US and Canadian systems may also include such temperature classes as T2A, T2B, T3C, etc., which indicate more precise temperature ratings. As mentioned previously, there are several methods by which devices can prevent explosions in hazardous areas. First, an explosion-proof, flame-proof, or powder-filled device is one in which the explosion is contained and extinguished. Second, limiting the energy of the device to a point where combustion becomes impossible even in the presence of a flammable material, effectively removing the ignition source, is known as intrinsically safe or nonincendive. A non-incendive device prevents ignition under normal conditions. An intrinsically safe device prevents ignition in doublefault conditions. Lastly, a device can simply keep the flammable materials out of the electrical or heat producing components through pressurization, encapsulation, oil emersion, fiber and flying protection, or protection by enclosure. The particular protection concept that a device uses is represented by a marking on the device such as AEXd (Flameproof C1 Z1), Ex ia (I.S. CI Z0). These markings can be looked up on tables and charts available online from the various hazardous area approval agencies. A device that has been certified by one of the aforementioned agencies will bear that agency's mark so that the device purchaser and installer can know immediately that the particular device is approved for use in a hazardous area. All of the information about area classification, division and/or zone, equipment group and temperature class is also provided on the equipment label. It may not be readily apparent how to make sense of it all, however. Below is an image of the product label from a Precision Digital product, the PD8 ProtEX-MAX, with all applicable agency approval information. What may look like a jumble of letters and numbers is actually very specific and crucial information that is necessary for any hazardous area application. An installer or purchaser needs to be able to break down this code in order to properly vet the equipment being installed. Understanding the regulations and standards by which industrial equipment should be approved in order to operate in a hazardous area is fundamental to ensuring the safety of personnel and property. As evidenced by the unfortunate events which took place at the sugar refinery at Port Wentworth and by many other industrial accidents that have occurred before and since, great precautions must be taken when working with potentially flammable materials. The hazardous area regulations pertaining to electrical devices operating in potentially flammable environments are only one small part of the regulatory requirements necessary in order to prevent disastrous situations. However, being able to understand the specifications and classifications of hazardous area devices is imperative to purchasing and installing the correct equipment for your location. If you or someone you know is unsure or unaware if their work environment is potentially hazardous or for more information on hazardous area specifications, contact your local agency representative.